If you're thinking of spending some time in the Indonesian paradise that is Anambas but you're not sure how you'll be getting around or whether there's any reliable public transport system at all, then get the skinny below. You may already know that Anambas is a collection of over 200 islands, an archipelago. Water-logged regions that comprise many separate islands are never easy to navigate from one end to the other, unless you own a boat of course. So how do people get around in Anambas? Is there any public transport? Well, the first thing to note is that few people ever really need to go from one extreme to the other of the Anambas. Most of the locals just go from A to B within the island they live on. 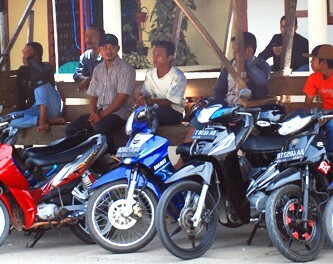 In the vast majority of cases, they own a moped, locally known as "ojek" to get them around. 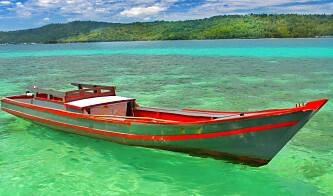 When inter-island travel is required, for example for commuters going to work or for kids going to school, a government-provided boat is typically available. This is the most common form of public transport on Anambas. For travelers visiting Anambas, there are other means to get around, other forms of public transport. If you need to go somewhere on the island you're on, or you want to really explore the island's every nook and cranny, then you can find an ojek owner willing to drive you. These ojek taxis can be found in Jemaja and Tarempa for instance. Just agree on a price with the owner before you start your trip. If you need the ojek for a longer time, say several days, then just come to a daily rate agreement. Oh, and always wear a helmet. Better to be safe than sorry. Ojek riders are usually strategically positioned around their island's ferry terminal, so look for them there if and when you need a ride. You can also rent an ojek outright. Cost varies, but it's quite a cheap transport option. Don't forget that you need to top up the petrol every so often. Most ojek riders top up their petrol by buying it from road-side shops that provide it in recycled 1.5L water bottles. Now, if you want to travel to another island altogether, or want to go on an island-hopping trip, you can go for the water-borne public transport system, i.e. a water taxi. Water taxis com in two types: the slower more traditional diesel-engine pompongs and the outboard engine speedboats. These speedboats are usually made from fibreglass and, as such, are lighter and faster. And a little more costly as a result. There are few 4-wheeled vehicles in Anambas, as the road network isn't that extensive yet. And most of these vehicles are government-owned. However, you may get lucky and get a ride if your destination is on the way. No harm asking.